Broken the glass and LCD on your Samsung Galaxy Ace 3? Do not worry we offer a fast UK based screen repair for your Samsung Galaxy Ace 3, all our parts used are genuine Samsung parts. 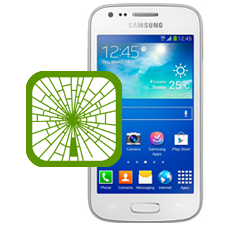 A broken screen is classed by Samsung as a non-warranty repair and they will charge you accordingly. This Galaxy Ace 3 screen repair service is a cheaper option and performed to our professional high quality standards. * Price includes a brand new genuine Galaxy Ace LCD and glass touch screen, fitting and fully insured return shipping in the UK. This is an in-house Samsung Galaxy Ace 3 screen repair service, when ordering this Galaxy Ace 3 screen repair service you are required to ship the units into our repair centre for works to be completed.